In 1770 the University of Perpignan set up a natural history cabinet, mainly for teaching purposes. During the revolutionary period it mas used by the central school which broke off its activities in 1803 ; the collections, however, were partly preserved. In 1835 a learned society took possession of the collections, restoring them to order and reopening the cabinet, which in 1840 became the Municipal Museum. PERPIGNAN, the prefecture of the Department of Pyrénées-Orientales, formed the capital of the short-lived ancient kingdom of Majorca (1). Perpignan also lay at the centre of Roussillon province and became, in 1349, the eighth town in France to have a university (2). The University saw a fair share of difficulties until the middle of the eighteenth century when, under the influence of the Duc de Noailles, Marshal of France and Governor of Roussillon, and that of the Comte de Mailly, Lieutenant-General of the army of the province, it underwent rapid development. A new building was constructed (3), the existing three departments were reorganized, and a fourth department, of medicine, was created. Soon, the richness of the flora and fauna of the region suggested the establishment of a collection of natural history. This department was already decided upon in the eleventh declaration of the King, dated 31 March 1759. A decision was taken to organize a botanical garden and a course in botany which would be given by one of the professors of medicine. The creation of the natural history cabinet dates to 8 October 1770. Joseph Barthélémy Carrère, the first director of the department of anatomy and surgery for the Faculty of Medicine, was awarded the post of director, with responsibility for the development and upkeep of the natural history collections. To this end he compiled an annual inventory, taking notes of every item and its state of preservation. As director, he had also to give lectures every Tuesday and Thursday in natural history, each of about a one-hour duration, from Easter to the end of the school year (4). Under Carrère's management, the cabinet, which was at first limited to local specimens, increased considerably over three years. The herbarium took in around 2,000 plants, whilst the geological section collected various metals, petrified rocks, crystals, salts, rocks and marble. In the animal kingdom, collections were made of fish and various other sea creatures. Later on, however, Carrère ran into difficulty with his colleagues (5) and complaints arose from as far away as Versailles. From there, Chancellor Maupeou wrote to M. de Bon, the first President of the Sovereign Board of Directors of Roussillon province, asking him to replace Carrère, whom he believed to be disloyal, with Joseph Béringo, a medical professor. Relieved of his duties on 3 July 1773 by the Royal Council, Carrère left the University of Perpignan in 1774. He went to live in Paris, where he was to become Royal Censor in 1775, and later medical adviser to Louis XVI. After the departure of Carrère, Louis Michel Costa Serradell, a disciple of Bernard de Jussieu and a protégé of the Duc de Noailles, who had been since 1767 a botanical professor with a special interest in the local flora, paid particular attention both to the botanical garden and to the natural history collection, until 1782. In 1782, the management of the cabinet went to Sauveur Masvezy, a medical professor who in 1786 left a long inventory of the collections, intended for Louis Marigo-Vaquer, Rector of the University. A commission was charged by the general assembly of the University on 13 August 1788 to produce a document that represented each faculty (6). The committee, which worked together for eight days from 28 to 30 September and from I to 5 October 1786, comprised Joseph Vasia, preacher and professor of theology, François Xavier Esteve, a doctor of law, Joseph Raymond, a doctor of philosophy, Béringo and Costa Serradell, dean of the Faculty of Medicine, along with Masvezy. The manuscript comprised eighteen pages. At the end of each day was inscribed : «Since it is now late, we will postpone until tomorrow the session, we all have signed...» The first two days of work were dedicated exclusively to the inventory of the ninety mineral specimens and the fifteen fossils, especially shells. In the following days the commission examined plant specimens of which twenty-three boxes held seventy-five plant cards. And finally they looked at the animal kingdom which contained lithophytes, zoophytes, crustaceans, starfish, insects, fish, amphibians, birds and quadrupeds. While actually concerned with the condition of the collections, this document demonstrates the state of taxonomy at the end of the eighteenth century, and shows that the system of classification established by Linnaeus in 1758 was still being used. For example, reptiles and amphibians made up a single class : it was not until 1816 that the work of Blainville divided them into two distinct classes. As part of a programme to stamp out privileges, the corporations were suppressed by an Assembly in 1791. The Convention, in the same frame of mind, in September 1793, suppressed by decree the twenty-three French universities, which were to be replaced by a series of educational establishments. Politically, this substitution is understandable, as the schools were dependent upon the central power, although the universities had been independent. In Perpignan the University was replaced by an école Nationale, and then, in 1795, by an Ecole Centrale (7). As the founders of the University were either removed or disappeared or emigrated to Spain (as did Costa Serradell), the maintenance of die cabinet ceased to exert any priority until the arrival of a young doctor called Emmanuel Bonafos (8). He was appointed professor of natural history at the Ecole Centrale and was also made director of the botanical garden. Upon his arrival from Paris, Bonafos found to his dismay that the botanical garden and the collections were in a state of neglect and that many objects had disappeared (9). Despite the many difficulties of the era, Bonafos had no intention of leaving the natural history collection in such a state of disrepair : not only did he resume the improvement of the collections, but he also took a stand for their defence, founded on a decree of 28 «frimaire» of Year Two of the Revolution (10), which prohibited all movement of collections other than that necessary to their conservation. Bonafos began to correspond with a fellow botanist, André Thouin, a member of the Institut de France, who had succeeded in the acclimatization of exotic plants in France. In a letter dated 1 March 1798, Bonafos put forward the idea of including in the botanical garden Spanish and African plants : he proposed that these plants should undergo a period of acclimatization in Perpignan, where they would remain for a few months before being taken to the national botanical garden in Paris. Bonafos' time was taken up with many tasks. He has left few written works beyond a «Note sur la flore du Vallespir», sent to La Peyrouse on 10 May 1800, and an inventory of all the objects in the natural history cabinet, signed and dated 20 January 1795. This inventory described in detail the layout of the cabinet. It enumerates thirteen elegant glass cabinets and their contents, a large gilt table, and a crystal chandelier. The collections were divided into three sections : Section Al, Geology ; A2, Zoology ; A3, herbaceous plants from over 1,300 taxonomie groups in six boxes. The plant collection encompassed species from the Pyrenees, the plains, and the sea shore. The collections, however, were starting to age and decay (11). Perpignan today is fortunate to own two detailed inventories of a natural history cabinet dating back to the eighteenth century, set up within nine years of each other, before and after the Revolution. In spite of their archaism, these documents carry a modern message of the unity of a valuable collection which gets its value from its very breadth. The inventory drawn up by Bonafos in 1795 is exact : as each object was labelled with the number 65, which was the departmental code for the Department of Pyrénées-Orientales. (The Constitution of 1791 had replaced the Provinces with Départements.) The codification of our inventory clearly shows the change in status of the collection, from being the private property of a local university to national ownership. After the fall of Robespierre on 27 July 1794, and the end of the Terror, France, despite economic difficulties and wars, regained an active cultural life. The seizure of numerous private collections during the revolutionary years led to the establishment of a number of museums all around the country, mainly in provincial towns such as Grenoble, Tours, Nancy, Auxerre and Nantes. The Perpignan collections, despite the changes of administration, remained in the natural history cabinet of the Ecole Centrale, still housed in the building of the old university. The new status of the collection, now a part of the national patrimony, can be seen once again in the ministerial circular of 21 May 1801 which questioned the Prefect on the collections of art and science material in his administrative area, and on the state of the cabinet. In reply Bonafos wrote a terse inventory dated 27 June 1801, delivered five days later by the Prefect to the Minister of the Interior. This procedure reflects the centralist character of the "Constitution de l'An VIII" dating from 24 December 1799, which entrusted power to a civil servant nominated by the Prime Consul. This was part of the reorganization of secondary education which led, in 1802, to the creation of secondary schools. To ensure the best conditions for the collections, Bonafos wrote as follows to General Martin, Prefect of the Department, on 15 August 1801 : «Many prefects, wanting to get natural history collections for the Central School of their department have sent the professor of this discipline to Paris. Almost all of them have obtained some fine collections from the interior minister and from the national Natural History Museum». Bonafos went on to ask permission to travel to Paris at his own expense, but he thought it correct «to collect and transport the objects at the expense of the botanical garden and/or small expenses at that of the Central School of Year X». It does not seem, however, that this request was granted before the closure of the Ecoles Centrales in 1803. Under a government decision of 28 January 1803, the cabinet passed into the trusteeship of the town of Perpignan. After a brief inventory was compiled, the collections were passed on to the vice-mayor, citizen Lasserre. Following a new governmental decision of 6 May, on 25 July the Prefect ordered seals to be placed upon the doors of the cabinet which, from then on, fell into neglect. In other French towns, collections experienced similar fates : in Dijon for example the museum was created only in 1836 from private collections seized by the revolutionary authority. In Perpignan the situation might have been somewhat different if at the time of the establishment of the national university, by law of May 1808, Napoleon had agreed to return the faculties to the town, but he failed to do so. They had to wait until the Restoration, for the Prefect receiving a letter from the interior minister, dated 20 November 1816, upon the state of the collections which had once served for teaching in the old Ecole Centrale, answered on 27 February 1817, that these collections were not very important ; he suggested that they «would have a greater impact if they were representative of the natural history of the various regions of the Pyrénées-Orientales». The minister took note of this idea, and enjoined the Prefect to put it to the town council of Perpignan. Bonafos, who apart from his medical duties was deeply involved in the natural sciences (12), was once more asked to put forward suggestions. Once again, however, this project came to nothing and the cabinet seemed shrouded by a cloud of indifference, despite the Roussillon region being rich in natural resources. During this period, the pharmacists Barthélemy Xatard of Prats-de-Mollo and Jean Coder of Prades collaborated on a botanical work of great importance (13) and the entomologists, J. N. Farines, L. Companyo and others made considerable contributions to the faunal knowledge of the region. In fact, all the natural disciplines were treated with great interest, sometimes even with an excessive passion as at the opportunity provided by the stranding of a rorqual at Saint-Cyprien in 1828 (14). This mania was not exceptional, nor was it confined to one region but represented a local manifestation of the universal expansion of the natural sciences based on primary observation, of which the peak is marked by the works of the great masters of the time : A. Brogniart, H. de Blainville, J.-B. Lamark, G. Cuvier, E. Geoffroy Saint-Hilaire, R. Hauy and A.-P. de Candolle. They still form valid references, and in spite of the refined experimental methods which are today the rule, they give valuable clues to modern scientists. Pedagogical necessity began the first cabinet, scientific pressure necessitated its revival and transformation, collecting brought in new specimens and questioning brought about thought, which contributed to debate and the exchange of ideas. A scholarly group was founded in 1833, named the «Société Philomatique des Pyrénées-Orientales», whose main aim was to concentrate on scientific matters. Gatherings of naturalists were frequent and often provided occasions for gifts for the collections. So important were the benefits from these gatherings that on 4 September 1835 the president, Jaubert du Réart, proposed the creation of a cabinet (in fact, simply the reformation of the earlier one). This task was entrusted to a committee, comprising D. Bouis, J. Jaubert du Réart, Farines and Companyo. In 1836 the collections increased considerably : for example, the remarkable panel given by M. Aleron «terrestrial and aquatic snails of the Department of Pyrénées-Orientales», still on display at the museum, dates from that year. A committee, made up of Companyo, Delocre and E. Sirven, was set up in the same year, with responsibility for the inventory of the collections. The following year Eugène Boluix, a naval officer born at Argelès-sur-Mer, learning of the natural history cabinet at Perpignan, made it known that he was willing to offer to the town a «fine collection of more than three hundred sea birds from the South Seas and Africa, many displays of insects and butterflies and several quadrupeds from Brazil and the orient». His only conditions were that a suitable location should be found and that a small sum for installation should be provided by the town council. Encouraged by this offer and concerned for the upkeep of the collections, as well as their role as an educational service to the public, the Society found a suitable location. The cabinet had, up to that point, been provisionally housed at premises owned by Companyo, who had been named temporary curator by the Lord Mayor. In 1839 the Society diversified, renaming itself the Société des Pyrénées-Orientales, Sciences, Belles-Lettres, Arts Industriels et Agricoles. 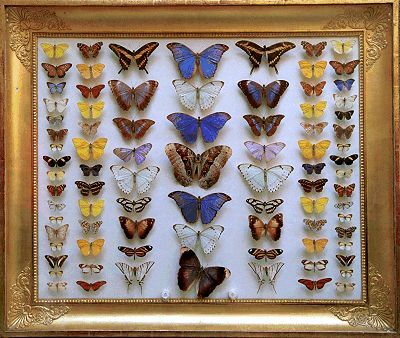 The municipality being unwilling to make the necessary payments for exhibiting the natural history collection, the Society asked for its transfer, for display in suitable cabinets in their meeting hall. On 15 March the town council agreed ; by May everything had been settled and donations were increasing. The prestige of the Perpignan collection began to extend beyond the local region, attracting the attention of the central administration : the Home Office decided to send a variety of natural history objects from the Museum National d'Histoire Naturelle in Paris to Perpignan. During his retiring speech the president, François Fraisse, summarized the Society's role in the formation of the cabinet. «The town owes us, gentlemen, the natural history cabinet which embellishes the place of our meetings. Vaisseau's lieutenant E. Boluix sent us an extensive collection of birds and insects which enabled us, in one move to own one of the most beautiful cabinets of any county ... I cannot help but recognize the enthusiasm of L. Companyo : more than five hundred animais were stuffed by this naturalist». In reply Boluix commented that during his previous voyage he had gathered a remarkable colleçtion of reptiles, which he had intended to give to Perpignan : however, as no official decision had been made concerning the installation of the natural history cabinet, he decided instead to offer the collection to the Montpellier museum. From the moment that the town began to live up to its responsibilities, things began to improve, but the development of the cabinet did not take place without financial problems, which the Society could scarcely manage. From 28 March 1840 the Society was reminded that the natural history cabinet had always been considered as the town's property. In forming it, the Society had only public interest in mind and now decided to review the cabinet, pointing out the expenses that their setting-up had incurred. The Society then asked the town council for a loan of 2,000 francs. Although the Society had transferred the items, it decided to maintain administrative rights over the cabinet under the patronage of the local authority. As a committee of the town council had already studied the problems concerning the natural history cabinet, and in particular the financial situation of the Society, on 6 April 1840 the council was able to authorize the mayor to buy storage furniture for up to 2,000 francs on behalf of the Society. Soon the council, although realizing the usefulness of the role of the Society, decided to reclaim the town's administrative rights over the museum. Moreover, the need for more rational management of the cabinet was increasing. The Society proposed the following solution, as recorded in the report of the committee of 4 June 1840. Article n° 1. The Société des Pyrénées-Orientales states that the natural history cabinet is the property of the town. Article n° 2. The Society accepts the grant of 2,000 francs voted by the town council during the meeting of 6 April 1840, in order to cover expenses for the construction of the cabinet. Article n° 3. The Society, in renouncing its property rights and its usufruct, reserves nevertheless the right to nominate three candidates so that the town council may chose one of the three to be selected as curator of the museum. As his duties would include long hours and a challenging workload, the Society requires that he be paid in relation to his duties, the town council to determine the amount. The Society, which recognizes the undoubted need for a curator for the museum, will contribute the enthusiasm of all its members, as it is required to give to this local establishment in order to assist the town council in its development. During its meeting on 4 August 1840 the council approved the proposals, despite certain reservations concerning the manner in which the curator should be chosen. It was made clear that once appointed, he would be treated in the same way as other employees paid by the town. On 16 December 1840 the Society nominated three candidates, Companyo, Farines and Meric, from amongst whom the council was to choose the curator. The town chose Louis Companyo, who was installed on 21 December 1840. Since that time the management of the cabinet, now named the Museum d'Histoire Naturelle, has been assured by the town of Perpignan. Under the leadership of the newly appointed curator, the Museum d'Histoire Naturelle began to prosper greatly. Due to Companyo's hard work and numerous connections (among them the well-known astronomer François Arago (15) and the Egyptian Caliph Ibrahim Pacha), Companyo was able to gather a splendid collection for the museum, up to the time of his death in 1871. He collected several hundred species of local birds (16), numerous molluscs (17), a range of insects (18), a series of ethnographic objects from Oceania (19), and, also from Ibrahim Pacha, an Egyptian mummy still in its coffin (20) along with a fine collection of Egyptian items donated by his son Paul, a physician with the Suez Company during the construction of the canal (21). From this cultural centre, towards the end of the nineteenth century emerged savants such as the academic Charles Deperet and the archaeologist Albert Donnezan, who bequeathed to the Museum an important part of his precious palaeontological collection to be shared with the Museum of Lyon (22). In the twentieth century the emphasis in the study of biology changed from methodological ideas to experimental procedure. Subjected to a series of financial and human constraints, natural history research tended to be attached to universities and the larger research institutes. The museum then became witness to the history of science (23) and also served as a cultural centre for scientific information, whilst losing importance as a leader of scientific research (24). As with most museums outside Paris, the general tendency was towards closure, perhaps attributable to the repercussions from major world conflicts. The Perpignan museum collection suffered greatly due to the move forced upon it in 1900, to the Zagarriga house, where space was too limited (25). Today the museum has regained popularity ; visiting the Museum is a form of homage the townspeople pay to the most ancient and respected cultural institution of the town. The Museum is surviving evidence of the historical university reinstated and maintained throughout the years by the knowledge and passion of numerous generous and clear-sighted men. (1) The Kingdom of Majorca, given by the King of Aragon to his son Jacques, included the Balearic islands, the Roussillon, the Cerdagne, and the seigneury of Montpellier. This position was maintained from 1278 to 1344. (2) After the dissolution of the Kingdom of Majorca, the Roussillon, having separated itself from Montpellier, was denied a university. To compensate for this loss, King Pierre of Aragon decided in 1349 to found the University of Perpignan. (3) Presently occupied by the Archives Municipales. (4) R. Bourgat, «Les collections de sciences naturelles, témoins actifs de l'histoire des sciences», Actes du colloque REMUS, La muséologie des sciences et des techniques ; 12-13 décembre 1991 (Dijon, 1991), pp. 199-205. (5) Carrère was also inspector-general of mineral waters for the Roussillon province and the earldom of Foix. King Louis XV also appointed him to manage the hot waters of Les Escaldes in Cerdagne. (6) The University of Perpignan was composed of four faculties : Law, Literature, Theology, and Medicine. (7) The «Ecoles Centrales» were created by decree on 23 January 1795, offering a wide selection of courses : literature, mathematics, physics, natural science, modern languages, history, social and moral sciences. The courses were not free. (8) Emmanuel Bonafos (1774-1854). Doctor of medicine at the University of Montpellier (1790), also a member of the Société Royale d'Agriculture (1799), and first archaeologist of the Société d'archéologie des Pyrénées-Orientales (1800), curator of the departmental nursery (1871) and also manager of the Société Agricole, Scientifique et Littéraire des Pyrénées-Orientales, was suspended from his duties in 1848. (9) R. Bourgat and F. Belledent, «Notice historique sur le Museum d'Histoire naturelle de Perpignan», Bulletin de la Société Agricole Scientifique et Littéraire des Pyrénées-Orientales 91 (1983), pp. 137-55. (10) i.e. the third month of the revolutionary calendar. (11) Note from Emmanuel Bonafos to the Prefect, 27 June 1801. (12) 12. Curator of the botanical garden, he also advised and accompanied A.-P. de Candolle on his botanical journey into the Pyrénées-Orientales. (13) Their herbaria, unfortunately, were not established in the region ; the first ended up in Montpellier and the second in England. (14) The identification of this rorqual caused a great controversy between those who favoured identifying it as a new species and hoped to dedicate it to the famous astronomer François Arago, and the classicists who acknowledged it as Balaenoptera physalus. It required several exchanges with the Academie des Sciences in Paris before the second proposal was accepted. See R. Bourgat and R. Duguy, «Premier échouage d'un Ziphius cavirostris (Cuvier, 1823) sur le littoral roussillonnais», Conflent 133, 1 (1985), pp. 20-9. (15) R. Bourgat, «François Arago et le Museum d'Histoire naturelle de Perpignan», Actes du colloque national des 20-22 Octobre 1986 (Cahiers Université Perpignan 2) (1987), pp. 109-16. (16) G. Berlic, «Oiseaux récoltés dans les Pyrénées-Orientales», Bulletin de la Société Agricole Scientifique et Littéraire des Pyrénées-Orientales 91 (1983), pp. 157-63. (17) R. Guyonneau, P. Menezo, D. Mary, J.-P. Pointier and R. Bourgat, «Les Cypraeidae du museum de Perpignan», Annales du Museum d'Histoire Naturelle de Perpignan 3 (1993), pp. 15-30. (18) J. Brémond, «Les papillons de la collection Dominique François Arago (1786-1853) du museum de Perpignan», Conflent 161, 5 (1989), pp. 17-51; J. Brémond, «Papillons remarquables de la collection du Museum de Perpignan», Conflent 178, 4 (1992), pp. 43-52. (19) A. Lavondès, «Collections polynésiennes du Museum de Perpignan», Annales du Museum d'Histoire Naturelle de Perpignan 4 (1994), pp. 3-12. (20) D. Bousquet, N. Cardus and H. Gracia-Natal, «Le sarcophage et la momie égyptienne du museum de Perpignan», Annales du Museum d'Histoire Naturelle de Perpignan 3 (1993), PP. 33-5. (21) R. Bourgat and M. Giordano, «Paul Companyo, un médecin perpignanais collaborateur de Ferdinand de Lesseps», Bulletin de l'Association du souvenir de Ferdinand de Lesseps et du canal de Suez, in press. (22) M. Philippe and R. Bourgat, «La collection de vertébrés pliocènes du museum de Perpignan», Bulletin de la Société linnéenne Lyon 6 (1985), pp. 146-60. (23) Bourgat, op. cit. (note 4), p. 2. (24) R. Bourgat, «La relation musée-recherche : le cas du museum de Perpignan», Colloque des Musées et recherches 29 novembre-1er décembre (Ministère de l'Enseignement Supérieur et Ministère de la Culture) (Paris, 1993), pp. 12-13. (25) E. Combes and G. Loutrel, Guide du visiteur du Museum de Perpignan (Perpignan, 1910), p. 44.